If you’re one of the hundreds of new daily visitors to BeHappy101.com or a new subscriber to this BeHappy! Newsletter, welcome! I’m Jimmy, and my mission is to improve your life by making it a bit happier - or, better yet, a lot happier - everyday. I am a doctor, “rejuvenating” corporate executive, entrepreneur, author, and speaker. My wife (Jill), our five-year-old daughter (Joie), and our two-year-old daughter (Jae) live in Tampa Florida and Newport Beach California. Through this newsletter, my website, my books, E-Coaching, and other BeHappy! products, I am committed to improving the lives of as many people as possible. So, I would love to hear from you on how your life has changed by using the BeHappy! system, or how I can help improve your life more by making the system even better. Just click here to provide your happiness tips, comments, suggestions, stories, or thoughts and I’ll respond to you personally – as appropriate - as soon as possible. The purpose of this newsletter is to provide a regular and consistent supplement to the action-oriented process found within my website - www.behappy101.com - and in my first book, simply called BeHappy! BE ON THE LOOKOUT: Starting within the next couple of issues of The BeHappy! Newsletter we'll begin a 6-month "relationship" series designed to improve your relationships significantly. Or, if you're looking for that "right relationship", this series will help with that, too. So look out for the start of this series by the August edition (maybe even sooner). 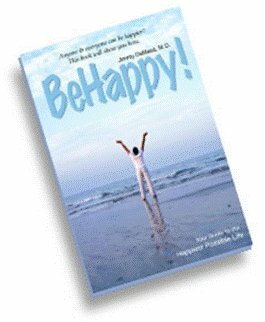 Since my goal is to help make people happier, however, it is best to get the book, BeHappy! to use along with the website to achieve maximum benefit from the plan (yes, that’s partly a sales pitch — but it’s true). If you do 20 minutes of exercise, three days per week for six months, your general feeling of happiness will improve by 10-20%. According to a new look at a 40 year old study on child rearing practices conducted at Harvard University, those children who were hugged and cuddled more grew up to be the happiest. Is Your Self-Confidence As High as it Could Be? Did you know the single most important component that separates people who are successful from those who are not? The answer is Self-Confidence. How different would your life be if you had more self-confidence? Have you ever felt (or do you feel now) that you lack Self-Confidence in certain areas of your life? Are you afraid to start a new business, change jobs or step out of your comfort zone? Do you struggle with shyness? Are you frequently indecisive, or do you procrastinate? Do you have a fear of going on dates or finding love? Do you find yourself at a loss for words when you meet new people? Do you place other people’s opinions above yours? Do you have trouble believing in yourself? Do you secretly fear if you ask for what you want you will be rejected? Do you have a fear of speaking in front of a group of people? Has the lack of Self-Confidence ever made you worry that something might be WRONG with you... but you don't exactly know exactly how to change it? Do you secretly fear that no matter WHAT you do, your inability to be Self-Confident will hold you back for the rest of your life? If you answered 'yes' to any of these questions, you are not alone. More importantly, you can change the answer to all these questions to 'no'!! Feel more comfortable and relaxed in social situations. Fearlessly step out of your comfort zone. Be more powerful and persuasive with other people. Not let other people’s opinions affect you. Believe in yourself and achieve your goals. This is the #1 Blueprint For Building Massive Self-confidence And Improving Your Life In 30 Days Or Less. It's the exact steps used to move from stuck, desperate and frustrated to confident, happy and productive. Start Seeing Results Right Away! Click Here! to get this GUARANTEED system for building your self-confidence, success, and happiness tremendously. The February edition of this BeHappy! Newsletter introduced the final two components of our year-long, 7-part program designed to provide a “simple formula” (see below) for increasing your happiness significantly. These last two components were the final “2 R’s” of the “3R” portion of the formula - (the first 4 components were Gratitude, your Definition of Happiness, Contribution, and the first of the “3R’s” - Relationships). If you are a new subscriber, or if you just haven’t read all the previous editions in this year-long series, it would be best for you to go back and read the other 6 parts to get the most out of this process. You can read the introduction to this series (the February 2011 edition) by clicking here, the first step of the process (the May edition) by clicking here, the August edition by clicking here, the October edition by clicking here, the December edition by clicking here, and the February 2012 edition by clicking here. From the previous edition two months ago (February 2012), we discussed how “rules” (which we all have) and “regrets” (which most of us have) can reduce – or even destroy – our happiness. Did you do the exercises described in that newsletter to help reduce or manage your rules and eliminate or minimize your regrets? If so, I’m sure you have a different perspective on things today as compared to two months ago. Also, I am confident your relationships have even improved to some degree because of your reduced rules. And with regard to regrets, did you take “The Rocking Chair Test”? For those who didn’t take the actions recommended, take the time to go back and do it now. Trust me, it will have a very positive effect on your life. In this year-long (7-Part) series, which started in February 2011 and finishes today with this edition, the objective has been to help you be as happy as you can possibly be by introducing you to a “simple” formula (the word ‘simple’ is in quotes because it is simple, yes, but not necessarily easy to implement into your life). ... where “H” stands for Happiness (described in the February 2011 edition of the newsletter), “G” stands for Gratitude (described in the May edition), “DH” represents your Definition of Happiness (described in the August edition) “C” refers to “Contribution” (described in the October edition) and “3R” stands for the fundamental “3-R’s” of happiness – Relationships, Rules, and Regrets, where the first "R" - Relationships - was addressed in the December edition and the remaining 2 “R’s” – Rules and Regrets - were addressed in the February 2012 edition. But as I just mentioned, while this is a “simple” formula (meaning it is quite simple to learn and understand), it is not necessarily “easy” to follow or implement into your life. Starting with the “G” (Gratitude), we all know life can be tough. Bad things happen. Problems, stress, and challenges are almost certain. By being a grateful person, though, you can reduce or eliminate the majority of the “unhappiness” these negative situations can create. What the graph on the right is attempting to show is that (1) unhappiness decreases as gratitude increases (the middle red and green lines), but that (2) even while gratitude is increasing and unhappiness is decreasing, our level of happiness only gets partway to "Total Happiness" (the lighter, lower line). To address this, as you are becoming a more grateful (and less unhappy) person, it is also critical to know your own personal Definition of Happiness. You may think you know it, but it’s not as easy as it sounds. Most people don’t really know what would truly make them happy. And, everyone’s definition is different. So, you must take the time to create your own definition for yourself and then develop a plan to achieve the components of that definition (see below for help with this). You can see this represented on the right axis of the graph above where your Definition of Happiness increases "happiness" from below a "6" to above a "7" in this example. Contribution (“C”) – the next part of the formula – is essential for anyone to be as happy as possible. And, as described in that edition of the newsletter, this doesn’t just mean giving money (like writing an annual check to a charity or something - although that can certainly count). It is much broader than that, though. Contribution comes in many forms. It could be anything – like regular little random acts of kindness. So find a way to make regular and frequent contributions to others (even small ones) and you will increase your level of happiness greatly. This is again represented on the right axis of the graph where contribution is shown to increase happiness to over "8" in this example. Finally, understand and address your “3R’s” of Happiness (Relationships, Rules, and Regrets). These three factors are essential elements to living your happiest possible life. And this goes for everyone – regardless of your Definition of Happiness. So, it is “essential” that you address these 3 R’s in your life. 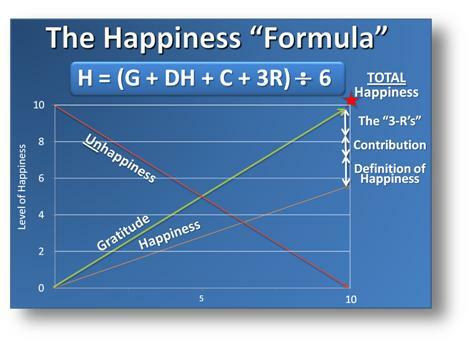 These are really powerful components of the formula - and are shown in the graph raising happiness from a level "8" all the way to "10" (which is "Total Happiness"). So, to bring this one-year series to an end, check out the actions section below to continue the process. If you have done the exercises throughout the series, much of this has likely become habit (which is the goal, if you want to be truly happy). And if you want more help, please go to BeHappy101.com, get the book, BeHappy!, or take advantage of my free coaching plan by clicking here and I'll help you personally to make happiness a "habit". So, now it’s time to take action toward addressing the entire “Happiness Formula”. Take these actions over the next sixty days and by the time you receive the next edition of the BeHappy! Newsletter (around mid-June), you will have a much better sense of how you can increase happiness in your life significantly by using the “Happiness Formula” effectively. By addressing each component of this “Happiness Formula” as describe here and in the previous 6 editions of this newsletter, you will definitely improve your life tremendously. So, the first action for anyone who hasn't yet read the past 6 editions of the newsletter is to go back and read those (I know - you're tired of hearing me say that - so this is the last time I'll say it). Add the 6 numbers together to get a total and then divide by 6. This will give you a "Baseline Happiness Score” of between 1 and 10. The higher the number, the happier you are (so a “1” is totally miserable and a “10” is totally happy). Next, create a “Happiness Plan” for your life based on starting at your baseline score (say it’s a “6”, for example) and ending up where you want to be (perhaps a “9” or “10”). Use the strategies from the past editions of the newsletter, from BeHappy101.com, from the book, BeHappy!, and from my free “Happiness Plan” template to help you develop the plan (get the template free by clicking here). Using your Happiness Plan and the strategies outline in the previous 6 editions of the newsletter, focus on each of the 6 components of the formula - one at a time - to create ways to improve each of these areas of your life. Finally, calculate your “Happiness Score” after you have gone through the process above to see where you are, and then at least once a year to assess your progress and your degree of happiness to help you focus on the areas which are causing you to be less happy than you could be. KEEP USING YOUR HAPPINESS PLAN AS YOUR GUIDE!! As always, we’ll look back on this 60-day action plan in the next edition of The BeHappy! Newsletter around the middle of June - where we'll then take some brand new steps toward making profound improvements to your happiness – and your life.”. A whole new structure will be coming to BeHappy101.com at the end of May. There will be lots more free stuff, a simpler navigation system, and the introduction of many new products and services intended to help you live your happiest possible life.